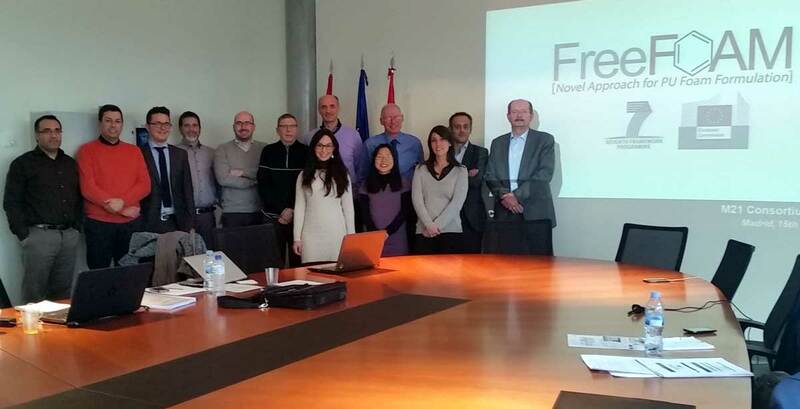 15th of January 2015 in Madrid, Spain, the Inspiralia hosted the fourth meeting of the project consortium FreeFOAM. Each of the partners gave presentations on individual and collaborative activities since the previous meeting in accordance with the planed project framework of ‘work pack-ages’ and ‘deliverables’. The meeting discussed and agreed the various activities to be undertaken by the part-ners during the next six months where the primary technical focus would be geared to scaling up the process for PUR expanded foam production trials. The meeting concluded with a very significant laboratory demonstration of isocyanate microencapsulation by Inspiralia Staff; this being a major milestone in the course of the project. The project passes in the second part where the partners will focus on finalizing the results and prepare to enter the market. Project Co-funded by the European Commission.